It controls changes in the educational system and its funding structures. Local authorities are primarily responsible for public spending on schools. The government is very keen for authorities to distribute money directly to schools to spend as they wish. Local authorities therefore have a more strategic rather than operational role within schools. Local education authorities have two budgets: a Schools Budget and a LA Budget. The Schools Budget covers pupil costs while the LA Budget relates to other key LA functions such as providing adult education and training. After the education authority has used up its share of the Schools Budget the remainder is given to schools in the form of 'budget shares'. The power to spend these budget shares is delegated to the school’s governing body. In effect, schools do not have to use the services provided by education authorities, such as catering, security, grounds maintenance, ICT support and cleaning services. They can go to alternative providers from the community if they are cost-effective and competitive. In practice, much of this comes down to head teachers. Governing bodies take a largely strategic and critical friend role. They will set the aims and objectives for a school and monitor progress. They are also responsible for implementing the recommendations of inspection reports and are required to make these reports and their action plans available to parents. The Independent Office for Standards in Education (Ofsted) is a non-ministerial government department headed by the chief inspector of schools. Their job is to inspect all state schools and report on standards of achievement. Its role also includes the inspection of further education, local authority children's services, teacher training institutions and some independent schools. Ofsted is responsible for inspecting all age 16 to 19 education and for the regulation of early years childcare, including childminders. The government publishes league tables of all schools in England . These publicise the performance of each of the schools. League tables are also published on the basis of A and AS-level and GCSE results. The National Curriculum is compulsory in all local authority schools throughout England . It is formulated and monitored by the Qualifications and Curriculum Agency in England . The aim of the National Curriculum is to raise standards and to ensure that schools around the country are following the same courses. The National Curriculum also includes key stage tests which mean that pupils are assessed at various stages throughout their education. These National Curriculum tests are more popularly known as 'SATS' even though the proper term would be 'National Curriculum' or 'Key Stage' tests. Children younger than 5 are in the Foundation Stage of education, and the 16-18 stage is sometimes known as Key Stage 5. The types of school in England are defined by who employs the staff, controls admissions and who owns the land and buildings. There are four categories of mainstream primary and secondary schools in England. Secondary schools can also specialise further to become specialist schools or City Technology Colleges, for example. Community schools: These were previously county schools. The LA employs the school staff, owns the school land and buildings and decides the arrangements for admitting pupils. Foundation schools: Many of these were formerly grant maintained schools. The governing body employs the school staff and has primary responsibility for admissions. The school land and buildings are owned by the governing body or a charitable foundation. Voluntary Aided: Many of the voluntary aided schools are church schools. The governing body employs the staff and decides admission arrangements. The land and buildings are normally owned by a charitable foundation. Voluntary Controlled: These are almost always church schools and the lands and buildings are usually owned by a charitable foundation. The LA employs the school staff and has responsibility for admissions. Between the ages of two and five, children may attend a pre-school. The government’s Sure Start scheme provides free sessions of nursery education for all four-year-olds and three-year-olds. The government is working with local authorities to develop a network of children’s centres dealing with early education, childcare and family and health services. At the latest, children start primary school education in the term after their fifth birthday. Primary schools are divided into the infants (five to seven) and the juniors (seven to eleven). Specialist schools: Any maintained secondary school in England can become a specialist school in areas such as technology, languages, science, sports or arts. The schools meet full National Curriculum requirements, but have a special focus on the chosen speciality. They raise £50,000 from private sector sponsorship and prepare plans for improvements in teaching and learning. Academies: These are schools that are state funded and free to students but they have much more independence than most state schools. They can be established by sponsors from business, faith or voluntary groups working with the community; individual schools or schools working in partnership. They can be more flexible with their curriculum and staffing to meet local needs. They were originally set up as a way of bringing high-quality schools with heavy investment in facilities and technology to disadvantaged areas. Grammar schools: Some local authorities still run a selective secondary school system with grammar schools. Pupils in these areas will sit a test at the age of 11 called the 11-plus test. The results of this test will determine whether they gain entry to the local grammar school. There are around 150 state grammar schools in England . There has been some debate about whether to stop admission by academic ability, but no steps have been taken. City Technology Colleges: These are funded directly by the government and offer a wide range of vocational qualifications alongside A-levels or equivalents. They teach the national curriculum and focus on science, mathematics and technology. Faith Schools: Faith schools are schools with a religious character. Any new faith schools must have the agreement of parents and the local community, and be approved by the LA. Nearly half of faith schools are voluntary controlled. They teach the locally agreed religious syllabus and the LA is the admissions authority. Voluntary aided faith schools are responsible for setting their own admissions policies and teach religious education according to their religious precepts. Faith schools admit pupils on religious affiliation but many admit those who are not of the school faith. 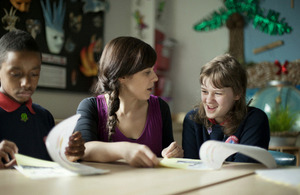 Special Needs: An estimated one in five children has some form of special educational need. The biggest education reforms in a generation for children and young people with special educational needs became law on Monday 1 September 2014. The new Children and Families Act 2014 offers simpler, improved and consistent help for children and young people with special educational needs and disabilities (SEND). As well as protecting the schools budget, it will extend provision from birth to 25 years of age. This will give families greater choice in decisions and ensure needs are properly met. The new system will extend rights and protection to young people by introducing a new education, health and care plan. Professionals will also provide more tailored support to families, giving them the help and assistance they need. Pupil Referral Units: Pupil Referral Units are a type of school established and maintained by LAs. They provide education to children who may not otherwise receive a mainstream education. A PRU might include teenage mothers or pupils excluded from school, for example. The aim of these units is to get pupils back into mainstream education. They are run by a management committee made up of a range of people from school governors to representatives from social services. Independent schools are fee-charging schools. They are known as private schools and sometimes as public schools, even though they do not exist within the state sector. They do not receive any public funds, and are governed and managed by special trusts. They are not obliged to teach the National Curriculum but most of them do enter pupils for the same public examinations as state schools. Independent primary schools fall into two main categories: pre-preparatory, for ages 2-7 and junior or preparatory schools for ages 11-13. The ‘prep’ school is devoted to preparation for the Common Entrance examination, which is required for many independent secondary schools. State Boarding Schools Association (SBSA) is the national association for state boarding schools within the UK ( England & Wales), formerly known as Stabis. SBSA schools provide high quality boarding at the lowest possible cost. You pay only the cost of boarding as the education at SBSA schools is free. This is only a fraction of the cost of boarding at an independent school. Admission to State Boarding Schools in the UK is limited to children who are nationals of the UK and are eligible to hold a full UK passport, those who are nationals of other European Union countries or those who have the right of residence in the UK. The holding of a BN(O) passport does not make the child eligible for a State Boarding School in the UK. Most state boarding schools are for ages 11-18, though there is one age 13-18 school, two which offer primary boarding as well as secondary boarding and one age 11-16 school with a nearby Sixth Form College. Most of these schools are mixed, but there are a small number of girls' only schools and boys' only schools. Steiner schools have a very distinctive philosophy, curriculum and teaching methods for pupils. They place the emphasis on the holistic development of the child including their “spiritual, physical and moral well-being” as well as academic work. Formal learning begins later than in conventional schools and there is a great emphasis on creative and artistic environments. They are self-governing and most schools operate as a co-operative without a head-teacher. There are schools, largely aimed at the children of foreign diplomats, which teach in a foreign language. The French Lycee is one such school: it has an English as well as a French stream. Montessori schools are nursery schools that follow the philosophy laid down by Maria Montessori, an influential thinker in childhood education. She observed that given the right environment, children could develop beyond conventional expectations. In a Montessori classroom children are encouraged to choose the activity they wish to partake in and complete it in their own time. Once they are used to making their own choices, they are naturally attracted to what will best serve their educational needs.